Kenyan authorities evacuated passengers and staff as emergency crews, reportedly low on water supplies, battled to contain a massive fire that has broken out at the international airport in the Kenyan capital. Hundreds of people were stranded outside of the Jomo Kenyatta International Airport (JKIA) in the capital Nairobi after a massive fire engulfed several buildings early on Wednesday morning. Part of the international arrivals building and Unit 1 departures were affected by the blaze, a statement from the Kenya Airports Authority (KAA) said. "KAA Fire and Rescue Team is on [the] ground being assisted by G4S and Nairobi Fire Brigade. Passengers have been evacuated to safety," the statement read. Scheduled flights at the airport were diverted to Kenya's port city of Mombasa, Eldoret in the northwest and Kisumu in the west, as well as to other countries. "Apart from emergency landings, all flights into and out of JKIA have been canceled... [the] airport has been shut down," said Mutea Iringo, a senior official at the interior and national co-ordination ministry. 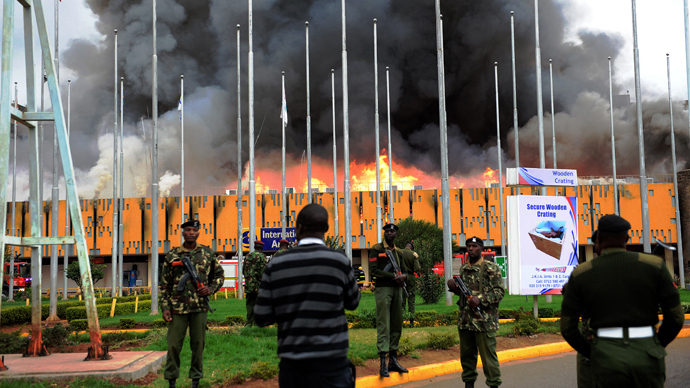 A JKIA official confirmed that there was no obvious terror link to the fire. The airport reopened later on Wednesday to accommodate domestic and cargo flights after the fire. Some international flights are expected to begin again on Thursday. Kenya has stated that it will prepare its small domestic terminal to handle international arrivals and departures, and has been setting up temporary waiting areas for passengers. "We started pitching tents on the airside for handling departing passengers," Michael Kamau, cabinet secretary for transport told reporters. Images posted on Twitter showed smoke and flames billowing from one of the main buildings at JKIA. Emergency crews fighting the blaze reportedly faced water shortages as the quenched the worst fire in the airport’s history. There were no reports of any casualties and the Kenyan authorities have not provided information as to the cause of the blaze. A passenger told Reuters that he heard two explosions “as if from gas cylinder or electricity fault” before the flames broke out. Kenyan authorities promised that domestic and cargo flights at JKIA would be restored by Wednesday afternoon. JKIA is a major transport hub and ranks as the busiest airport in East Africa and Central Africa. It is the sixth-busiest airport in Africa.